Jeff was awesome to work with! Very friendly, punctual and professional. The weeks and days leading up to our wedding he was in contact frequently trying to ensure he knew everything that we wanted from this experience. At first, I didn’t want to do a videographer.. but I’m so glad we did! He captured all the most memorable moments from that day! 10/10 would recommend!! He did an amazing job! 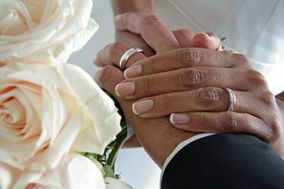 We changed our wedding date and were accommodated without any hassles. We love our video and recommend him to anyone looking to capture there big day! At first we weren't sure if we were going to hire a videographer for our wedding. I am so glad we did! Jeff was incredibly professional and punctual. He gave us the most beautiful wedding video I have ever seen. Now we have something we can cherish forever and copies to give out to our families. I can't reccomend Athena's Eyes enough!!! Jeff was extremely accommodating (even showed up to the rehearsal to map out the area) and the communication lines with him were always open (would always get back to you within an hour or by the end of the day). Any suggestions made will not only be heard, but will definitely be implemented by him. The various camera angles and the background music really made our DVD pop, and the incorporation of small details (like our ceremony program) really surprised us. Many thanks Jeff! Jeff was great. He took video of just about everything including our wedding rehearsal. I love our wedding video, defiantly will be watching year after year. Athenas Eyes was worth every penny! Jeff was very responsive and listened to everything we wanted. He came to the rehearsal which eased my mind for the actual ceremony. The final product was amazing. It was so fun to watch our day unfold. He also suggested to ask for advice from our guests or have them say a few words and I am so glad he did. I would highly recommend him for your wedding!! Jeff did an amazing job with the videography of our wedding and reception. He even went above and beyond by coming to the rehearsal as well. He was professional and friendly. We received our video sooner than expected and are very glad we decided to go with Athenas Eyes for our wedding. I'm so glad we chose Jeff to cover our wedding. We were unsure at first if a videographer fit within our budget, but Jeff had very reasonable pricing, very quick email responses, and a great attitude. I received my first draft dvd within about 10 days of the wedding, which I thought was very fast. I've heard of others taking several months, so I was super excited to get mine so quickly. The first draft was great, there were a couple things I asked him to add or change (different menu music, extra dancing footage of a specific song) and he was happy to make the changes and send me a 2nd draft right away. He created a music video of the highlights that I was able to share with friends and family online, using a song that my husband and I chose together. Throughout the day/night, he went around to each guest's table and recorded their advice/comments for us. I'm so glad I have this to remember all of our guests by. Overall I'm SO happy we chose Jeff. For those of you that are undecided whether or not to get a videographer, do it! I know it would have a been a regret if we opted not to. It's so great to have this video and re-live our awesome night. And the night goes by so fast, there are so many memories on the video that I wouldn't have even known happened. Thanks Jeff !!! Jeff went above and beyond our expectations. My husband and I were very satisfied with our video. Jeff provided very personal service and made sure that we got exactly what we wanted. Jeff is a very professional, pleasant and a very easy going guy, His work for the price is outstanding! I recommend him to anyone who is planning an event that only a videogragher can make special and Jeff is the guy for the job! Thanks Jeff for your hard work and pleasant nature you really made our wedding memorable! Athenas Eyes Production did a video on our wedding, And it was awesome. We love it. High quality and affordable. I definitely would recommend them those who wanted to have video's on any occasion :) especially on your "wedding day"
Jeff was wonderful to work with, he provided quality service, and quality work for an affordable price. He showed up for the rehersal and was on time for every part of the wedding day for filming. The equipment he used produced quality picture and sound.